Masters athletes in five-year age group categories from 35 up to 75 from England, Wales, Northern Ireland and Scotland competed in three races as individuals and teams. The races were over three or four laps of a 2k spectator friendly course. The course was soft and demanding, and some found it good while others struggled in the energy sapping conditions. 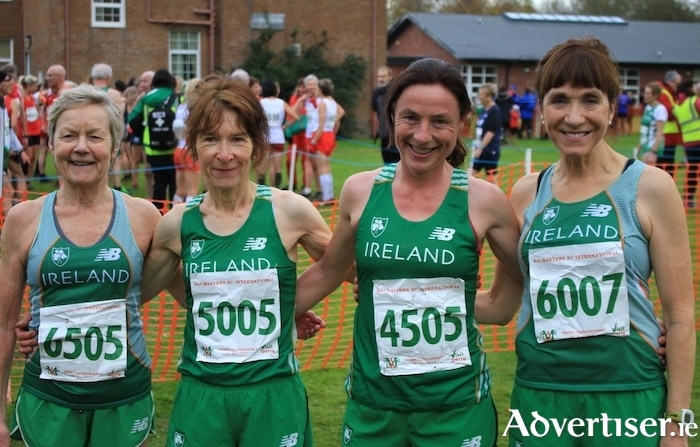 The four runners from Mayo AC had all qualified at the open Autumn trials in Abbotstown last month. They ran 6k in the first race which included all women and men over 65, 70, 75. The first three in teams of four counted towards medals. And they all ran their hearts out - leaving everything out on the circuit. The club is very proud of their continued success in these championships and their annual Mayo AC representation in the Irish masters team. Pauline Moran was in magnificent form finishing her first individual gold F60 medal and led her Irish team to gold also. She finished just ahead of team mate Christine Kennedy (GCH ). Angela O'Connor is a phenomenal cross country runner especially in soft conditions and won bronze with her F50 team. Mags Glavey had trained hard and was rightly delighted with her race. She led the F65 team to gold and added a well deserved bronze individual medal. Colette Tuohy as usual ran strongly and was third finisher in her silver medal winning F45 team. She was led home by a great performance by Carmel Crowley (Bandon AC ) and well supported by Emilia Dan who ran 2:58 in Dublin Marathon less than three weeks ago. They received their medals on Saturday night at the dinner and presentation of awards in the Everglades Hotel on the Foyleside waterfront. Ireland’s F35 team included Ballymote based Corran AC’s Sara Doohan who ran a great race and was well up with the leaders right through. She won bronze individual and gold team medals - a wonderful achievement on her Ireland debut. The overall race winner was Ireland's Claire McCarthy F40 (Leevale AC ) who ran a great race in the World Marathon Championships in London in August. Belmullet native. Evelyn McNelis (Naas AC ) was part of the Irish women's gold medal winning F70 team. England won the overall points competition as thry have since its inception, with Ireland in second place Congratulations to the four Mayo AC members - they're all seasoned International masters by now – it’s great to see them all coming home with medals again.